Today's Inspiration: The "Rapid-Turnover Freelance Factory"
In 1951, after rumbling back to the US from Mexico in his Hudson sedan, Flora started hustling design gigs to support his growing family (soon to number five children). He landed a Fortune magazine cover in 1952, and revived Coda for Columbia Records that same year. Aside from a short stint as Art Director for a doomed monthly called Park East, Flora was no longer tethered to a corporate desk. He became a rapid-turnover freelance factory, his graphic wizardry appearing in magazines, newspapers, and commercial literature until the early 1980s. (Throughout this period of gratifying commercial success, he continued creating woodcuts, prints, paintings and sketches as a fine art sideline.) His client roster included Mademoiselle, Fortune, The New York Times, Life, Parade, Computer Design, and countless other periodicals. In many cases, especially his pre-1960 oeuvre, all that now exists are foxed antiquarian issues and tearsheets. However, there are hundreds of later mechanical paste-ups in the Flora archives. He was often called upon to add a playful, even sardonic illustrative twist to journalism on serious topics. He developed a knack for producing cartoonish maps, complex graphs, and visual punditry on science, money flow, geopolitics, sociological trends, technology, and world tremors. (More on this tomorrow.) These strategically plotted mise en scenes often reflected a cynical fascination (perhaps influenced by Rube Goldberg and Boris Artzybasheff) with creeping machinism -- how technology increasingly subsumed the activities of hapless humans. 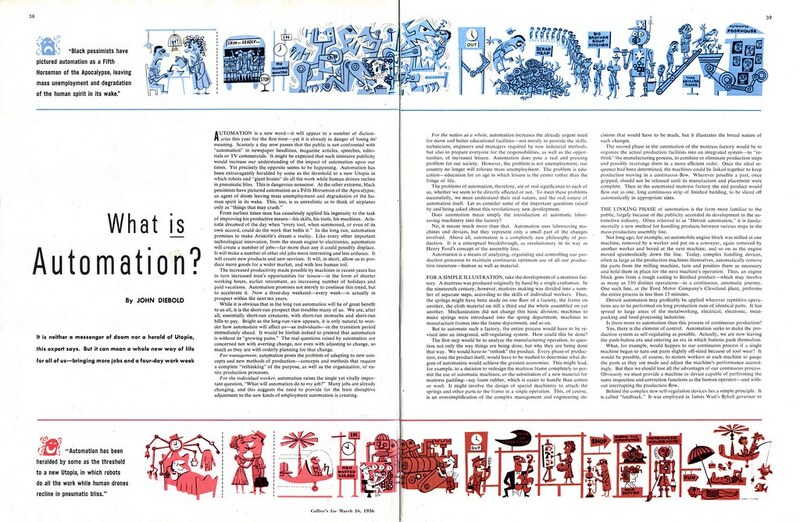 This is abundantly typified by "What is Automation?," which Flora contributed to Collier's magazine in March 1956. Nice information, valuable and excellent design, as share good stuff with good ideas and concepts,Free mobile wallet lots of great information and inspiration, both of which we all need, thanks for all the enthusiasm to offer such helpful information here.